Our last 4 Kentucky TOYs! Are you looking for a way to bring recognition to your program and your school? Do you have a colleague, administrator, or advocate that you would like to thank for their commitment to world languages? One of the benefits of membership to KWLA is that you are eligible to nominate deserving professionals (and be nominated) for our annual awards. 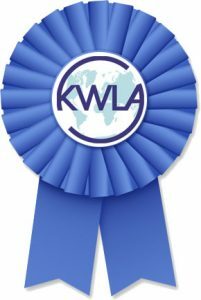 KWLA is seeking nominations for awards presented annually to educators and leaders in world languages. Please nominate an outstanding colleague today! The Kentucky World Language Association is seeking nominations for awards presented to educators and leaders in world languages! STEP 1: Review award eligibility criteria and required award nomination evidence outlined on the page for each award. Please complete the steps listed above by June 15th. We encourage members to start the nomination process early as you should estimate about one week to collect all necessary nomination evidence and to submit. Award recipients will be notified by email no later than August 31st and officially recognized at the next KWLA Fall Conference during the Awards Banquet to be held on Saturday of the conference. Awards recipients will receive two complimentary tickets to the Awards Banquet. Additional banquet tickets will be available for purchase. DISCLAIMER: A press release for winners of the Outstanding Teacher Award will be published within a week after the conference. Press releases for all other awards winners will be available by request only. The Outstanding Teacher of the Year Award (K-16*) recognizes an individual of the world language teaching profession who has demonstrated long-term achievement and service to the profession. Candidates for this award are automatically those who have been named the “Teacher of the Year” selected and awarded by the executive boards from the Kentucky Chapters of each of their own respective professional language teaching organizations (AATSP, AATF, AATG, KCA, KACLT, KAJLT, KY-NNELL). (*New this year and continuing on in perpetuity, teachers at the post-secondary level will be considered as candidates in this category as well!) The winner of this award will represent KWLA in the running to be named the Regional Teacher of the Year at SCOLT (www.scolt.org) or CSCTFL (www.csctfl.org), and then, potentially, at the national level at ACTFL (www.actfl.org)! The Outstanding New Teacher Award (K-16) recognizes outstanding new teachers whose excellence in world language teaching may not be recognized otherwise, and to demonstrate that the profession and KWLA care about new teachers and their professional growth. The Outstanding Administrator Award recognizes a school administrator who has demonstrated exemplary support of world language learning and teaching at his/her institution, community, or in the state. The Lifetime Achievement Award recognizes an individual of the world language teaching profession who has demonstrated long-term achievement and service to KWLA and to the profession – locally, statewide, regionally, and/or nationally. The Amici Linguarum (pronounced “ah mee kee leen gwah room”) Award recognizes an individual or organization not directly involved in the teaching of world languages that has made a significant contribution to the profession. 2008 – Margo Jang, Festival Director – Northern Kentucky Univ. 2006 – Elaine Jarchow, Dean of Education – Northern Kentucky Univ. Thank you! Merci! ¡Gracias! Gratias! Danke! NOTICE: The KWLA Awards Committee in consultation with the Executive Board may elect to not present an award in any of the categories mentioned above for a given year.